Do you want to be a sought-after resource in your niche? Do you need tips on how to become a Twitter influencer? To be a leader on Twitter, it’s important to understand the dynamics of Twitter conversations and the role of influencers. In this article I’ll show you the two most important types of Twitter influencers and how you can become one. 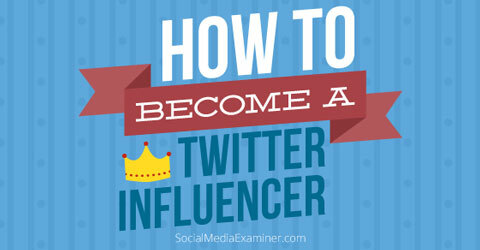 Find out how you can become a Twitter influencer. Recently, the Pew Research Group and the Social Media Research Foundation conducted an in-depth study of Twitter conversations. They examined thousands of conversations, including the roles of hashtags, retweets, follows, mentions and specific words. They then created maps of multiple subjects to discern patterns and structures. Mapping Twitter conversations shows how they spread. What they found was a “a taxonomy of six distinct types of conversations” each a different size, with varying levels of interconnectivity and an array of discussion subjects. There are six distinct types of Twitter conversations. 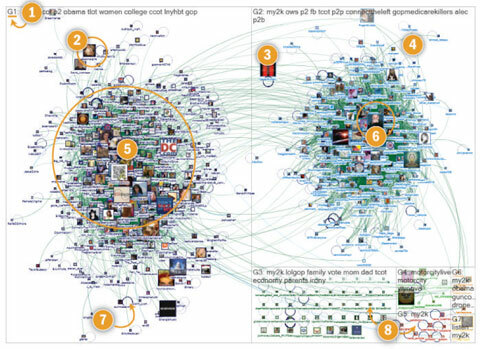 Network maps show that each kind of social media crowd has a distinct structure of connection and influence. Key users occupy strategic locations in these networks, in positions like hubs and bridges. This is the part that fascinates and interests me. I realized that if I could uncover the data characteristics of influencers, I could understand how to become one. Influencers are the glue of Twitter networks, providing tweet fodder and inspiring passion among followers. Conversations don’t exist without them, and their position within networks is a critical component of their influence. The more capably you navigate the Twitter social sphere, the more influential you become. Based on the Twitter study, there are two types of Twitter influencers—hubs and bridges. Hub influencers create virality by starting movements, creating hashtags and populating the trending board. In many cases, a hub is an influential individual or a media organization. As the center of a conversational network, a hub influencer tweets new information to a large network of followers, and those followers retweet that information. A hub’s tweets rely on original content and information. In the example above, Paul Krugman wrote an article discussing a government fiscal issue with political implications and the need to “mint that coin!” The content was original and proposed a massive idea that would revolutionize governmental spending. 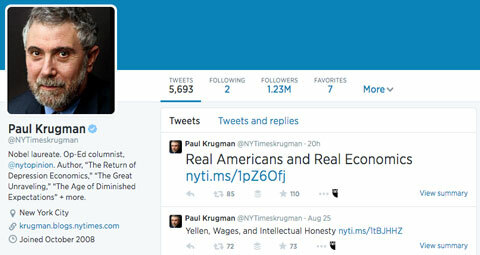 Because Krugman is a hub influencer, his article was tweeted by a large number of followers and was inflammatory enough to spawn trending hashtags such as #mintthecoin, #rethuglicans and #krugzilla, among others. 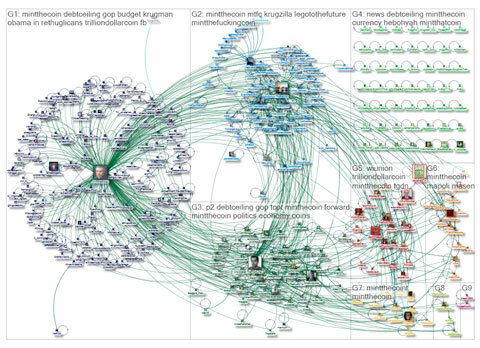 Paul Krugman is a hub influencer. The resulting Twitter discussion fell into two of the conversation types Pew found: Broadcast Network and Polarized Crowds. Becoming a hub isn’t easy. You must produce original information and that information has to be noteworthy enough to warrant retweets. And not only do you have to publish original information, but you also must have enough of the right kind of followers to gain retweets. You can’t be a hub without having a niche. The very word “hub” implies a wheel—a sphere of influence or effect. You need to know your niche, and then become highly familiar with its nuances, vocabulary, hashtags and personalities. Once you settle into your niche, it’s important to form connections. Many hubs have a limited number of people they follow and their influence depends on those who follow them. If you’re just getting started as a hub, you should follow the most significant people in your network. Most importantly, you should connect to “bridges” (discussed in the next section). While hub influencers create viral movements and hashtags, bridge influencers create virality by sharing relative content and connecting related groups. Pew defines bridge influencers as playing “the important role of passing information from one group to another.” Bridge influencers may not produce information, but they publicize it. Their influence depends on their position. Bridges stand between two or more groups, connecting the thoughts and ideas of one group to another. They identify relevant points among groups, and serve as a channel for that information. That sharing is often identified as the point at which a message goes viral. In the example below, there was one group that originally discussed #mla13 (indicated by the number 1). A bridge was responsible for bringing that hashtag virality to another group (number 2). A bridge influencer identified a popular conversation in a different niche, and then introduced it to their own niche. To become a bridge influencer, position yourself solidly by connecting to the sources of primary information (hubs) in your niche, as well as those in niches that have an effect on your primary niche. For example, let’s say a hub such as Search Engine Journal (SEJ) publishes an article on “Conversion Optimization and SEO.” The followers of SEJ are primarily in the SEO niche. However, there is another niche comprised of conversion rate optimization (CRO) experts. Members of the latter niche may not follow SEJ, but the article is relevant to their industry. This is where you, as a bridge, bring the SEJ article to the attention of the CRO community—connecting the SEO hub and the CRO community. 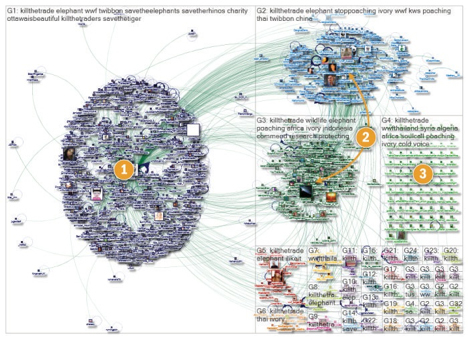 In the Polarized Crowd network map, two large dense groups of people talk about the same subject, but do not connect to each other or use the same words, URLs and other hashtags. There are few users who bridge connections between these groups. Few people who talk about this subject are “isolated” from others; most users are connected to at least a few others. As a bridge, you can serve as the link between the polarized network and outside conversations. Finally, you’ll need to discern what type of information is going to serve your niche. If you go too far off topic, you’ll become irrelevant or ignored by your niche. You need to sustain a balance of niche-relevant tweets and bridge tweets. There is nothing easy about becoming a Twitter influencer. It requires intention and strategy. But once you position yourself as a hub or bridge, you’ll be far more adept at shaping your niche and leading others. What do you think? Are you a hub or a bridge influencer? What content is most popular with your followers and groups? Leave your comments below. Neil Patel is the co-founder of Crazy Egg, Hello Bar, Stride, and KISSmetrics. He helps companies like Amazon, NBC, GM, HP, and Viacom grow their revenue.